New streaming service Apple TV + will launch in 100 countries later this year with a slate of original programming, the tech giant confirmed overnight. Hollywood heavyweights including Steven Spielberg, Oprah Winfrey, J.J. Abrams, Reece Witherspoon, Jennifer Aniston, Jason Momoa, Alfre Woodard and Steve Carell were part of the presentation by CEO Tim Cook in California. Pricing for the new service is yet to be announced. It will be ad-free, on-demand and available both streaming online and downloadable. Apple TV + was announced along with Apple TV Channels, another new service in the Apple TV app that will let people watch streaming shows, movies and sports in one place without having to use additional apps or accounts. Apple TV Channels and the new Apple TV app will be coming in May. These are the shows due to screen on Apply TV +. Friday Night Lights’ Kerry Ehrin will serve as showrunner, writer and executive producer for a series about morning show anchors starring Reese Witherspoon Jennifer Aniston and Steve Carell. Apple won a bidding war for the show, which will get two 10-episode seasons. Carell will be making his return to television as the male lead and morning show anchor, Mitch Kessler, it was announced at the Apple event. Carell is well known for his role as Michael Scott on The Office and his Oscar-nominated performance in Foxcatcher. Apple announced that husband-and-wife duo Kumail Nanjiani and Emily V. Gordon are writing and executive producing a show about immigrants. Here’s hoping it’s as magical as The Big Sick. Nanjiani appeared at the Apple event to provide more background on Little America. Apple has ordered See, a sci-fi drama set in a future where humans are born blind, written by Stephen Knight and directed by Francis Lawrence. Aquaman himself, Jason Momoa, has been cast as warrior Baba Voss, and Woodard has been cast as Paris, an adviser and priestess. Both Momoa and Alfre Woodard appeared at the Apple event to provide more background on the sci-fi show See. Based on a novel by Kathleen Barber about true crime podcasts, this drama, according to Variety, will star Octavia Spencer, along with Aaron Paul, Lizzy Caplan, Elizabeth Perkins and Mekhi Phifer. It’s being co-produced by Spencer’s production company Orit Entertainment, Reese Witherspoon’s company Hello Sunshine and Chernin Entertainment. It wasn’t mentioned onstage, but Spencer featured in the filmmakers short (above), and Caplan and Paul were shown in the trailer montage. Chris Evans (aka Captain America) will be executive producing and starring in Defending Jacob, based on the novel by William Landay. Defending Jacob is a crime thriller about a father whose teenage son is accused of murder. The show will be created, written and executive produced by Mark Bomback (screenwriter for the Planet of the Apes trilogy). 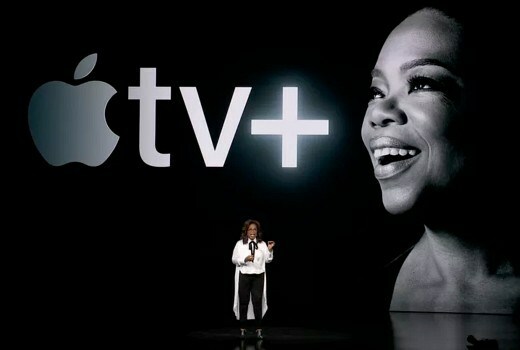 Oprah spoke at Apple’s event today to provide more background on her Apple partnership. She announced two documentaries, Toxic Labor and a multi-part untitled series about mental health. She also announced bring back her famous Book Club, as some sort of interview show. Apple’s partnered with Steven Spielberg’s Amblin Television and NBC Universal to bring us a 10-episode reboot of the anthology series Amazing Stories. Bryan Fuller was originally hired as executive producer and showrunner. He’s since stepped down and been replaced by Edward Kitsis and Adam Horowitz, best known for their work on Lost and Once Upon a Time. Spielberg spoke at Apple’s special event today to provide more background on the pilot. Apple is partnering with Sesame Workshop to bring us original children’s programming, though Sesame Street is not a part of the deal. Big Bird spoke with new neighbor Cody at the Apple event to provide more background on the series Helpsters. Apple is putting a comedic twist on the life of Emily Dickinson, with a series that will star True Grit’s Hailee Steinfeld. Apple has also announced 30 Rock’s Jane Krakowski will play Mrs. Dickinson, Emily Dickinson’s mother. While not mentioned by name, the show appeared onscreen numerous times. J.J. Abrams is executive producing a half-hour musical dramedy with songs written by Sara Bareilles. Depending on your tolerance for musicals, this show may or may not feel like purgatory. Abrams and Bareilles spoke at Apple’s event to provide more background on the show and Bareilles performed the theme song for the upcoming series. Now available on Apple Music. In this show, which premiered on Apple Music in June 2017, celebrity judges receive app pitches by developers. Because of course a reality competition about apps would be Apple’s first TV show. Unfortunately both the Planet of the Apps and Carpool Karaoke were flops. A series adaptation of the Carpool Karaoke segment from James Corden’s talk show The Late Late Show with James Corden, except with two or more celebrities in the car and no Corden. (Disclosure: Both of Corden’s shows are produced by CBS, which is also CNET’s parent company.) Episodes include the pairings of Game of Thrones’ Maisie Williams with Sophie Turner and Westworld’s Evan Rachel Wood with James Marsden. All 19 episodes of the first season are free to watch now. Apple announced this adaptation of Timothée Hochet’s French series, which uses audio but few visuals to tell its story. Apple has ordered 10 episodes and obtained the rights to the original series. Apple has landed the rights to Foundation, an adaptation of Isaac Asimov’s sci-fi novel series. “The premise, put as simply as possible with such a massive and influential series, deals with the preservation of knowledge prior to an oncoming dark age,” writes CNET’s Erin Carson. She also reports that the series comes from Skydance Television, which is responsible for shows such as Amazon’s Jack Ryan and Netflix’s Altered Carbon. The series will be helmed by Josh Friedman, the man behind Terminator series The Sarah Connor Chronicles, and David Goyer, co-writer of Dark Knight movies and other superhero flicks. Apple is developing a series based on Nathaniel Rich’s article “Losing Earth: The Decade We Almost Stopped Climate Change” that ran in The New York Times. Rich and Spotlight producer Steve Golin will executive produce. Jennifer Garner will star in and executive produce this limited series and she’s teaming up with Alias creator J.J. Abrams, who will executive produce the series as well. The series is based on Amy Silverstein’s 2017 memoir of the same name. Variety confirmed that Apple secured the rights to Jin Lee’s novel Pachinko, about multiple generations of Koreans who migrate to Japan. Soo Hugh, who was the showrunner for AMC’s historical drama The Terror, will executive produce and write the series. Variety has the scoop that Apple’s developing a series based on the early life of NBA basketball player Kevin Durant. Durant’s media company is partnering with Ron Howard and Brian Grazer’s Imagine Television. Though the film adaptation never got off the ground, Apple has secured the rights to develop Gregory David Robert’s novel into a series. According to Variety, American Hustle writer Eric Warren Singer will act as writer and executive producer. According to Variety, Captain Marvel star Brie Larson will executive produce and star in a drama series about a CIA undercover agent. The show is based on Amaryllis Fox’s memoir Life Undercover: Coming of Age in the CIA. Megan Martin, executive producer and writer for TNT’s Animal Kingdom is in final negotiations to write and execute produce the series. La La Land writer and director Damien Chazelle will write and direct a drama series for Apple, according to Variety. According to Deadline, Apple is making a series inspired by Hilde Lysiak, a child journalist who reported on a suspected murderer. The series is being produced by Dana Fox, Dara Resnik, Joy Gorman Wettels, Sharlene Martin and Crazy Rich Asians director Jon M. Chu, who will also direct the series. The Sixth Sense director M. Night Shyamalan will produce a 10-episode psychological thriller. He’s also slated to direct the first 30-minute episode. Six Feet Under’s Lauren Ambrose and Game of Throne’s Nell Tiger Free will star in the series, Deadline announced. Deadline announced that Ronald D. Moore, creator of the reimagined Battlestar Galactica, is working with Fargo producers Matt Wolpert and Ben Nevidi on a space drama. Central Park is an animated musical comedy from the creator of Bob’s Burgers, Loren Bouchard. The series was co-written with Nora Smith and actor Josh Gad, who will voice a character in the show along with Kristen Bell, Leslie Odom Jr., Titus Burgess, Daveed Diggs, Stanley Tucci and Kathryn Hahn. According to Deadline, the show is being picked up for two seasons and is about a group of Central Park caretakers who end up saving the world. Colleen McGuinness, a producer for 30 Rock is creating a comedy series for Apple, which Reese Witherspoon’s production company will produce. The series was originally slated to star Kristen Wiig, but she has since backed out of the project due to a scheduling conflict. Apple has ordered a half-hour scripted comedy series from It’s Always Sunny in Philadelphia creator Rob McElhenney and his Sunny co-star Charlie Day. The show explores the people who work in a video game development studio; McElhenney will star. Charlie Brown fans have something to celebrate. Apple is partnering with DHX Media to create new Peanuts content. DHX Media is known for shows like the Teletubbies and the Degrassi franchise. Apple plans to get into the docuseries game (competitor Netflix has a deep bench of material in this category). Variety announced that Home will be a 10-episode hour-long series looking inside some of the world’s most extraordinary homes. Deadline broke that Apple has acquired the rights to Terry Gilliam’s film Time Bandits. The series will be produced by Paramount Pictures, Anonymous Content and Media Rights Capital. Deadline announced that Apple has green lit a sci-fi series to be created by Simon Kinberg and David Weil. Kinberg is best known for his work as a producer and screenwriter on the X-Men franchise. Kinberg’s making his film directorial debut with Dark Phoenix, coming out later this year. David Weil recently created a TV series for Amazon, The Hunt, which will star Al Pacino. Justin Lin, known for directing four of the Fast & Furious films and Star Trek Beyond, is partnering with Apple and ending his TV deal with Sony. This multi-year deal will have Lin developing shows at Apple with a “global perspective.” His production company Perfect Storm Entertainment has produced shows such as Scorpion and S.W.A.T. Most of it doesn't impress me. But I'll check out Are You Sleeping? if Aaron Paul is in it because he's always great.